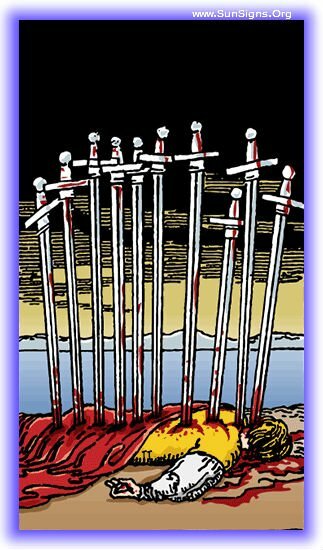 The Ten of Swords is perhaps the most bleak card in the Rider Waite tarot, and certainly the most bleak within the Minor Arcana. A man lies with his face down with ten swords stabbed in his back, and it heralds inevitable ruin, destruction, and the end of all good things. When this tarot card appears it is certain that defeat is at hand, and that you will experience some form of grievous loss. The only good place for it to be seen is in the past. If this most ominous of cards has appeared in your tarot reading, powerlessness and betrayal are feelings that are likely to be very prevalent in your heart and mind. Your life is inevitably to be full of loss, pain, and the endings of things. The good part of this card is that once this loss is past, the ground will be laid fallow, and the cause excised, removing it from being able to cause you further harm. This is the best possible result for the ten of swords, living in your past. Know that your time of trial and pain has passed, and further, that the cause of it has forever been removed from your life. The recovery may be long, and difficult, but it is in fact over. If the Ten Of Swords card is appearing in your reading in this position, you likely already know that which it speaks of. The loss you’re experiencing right now is total, and permanent, and the recovery period will be hard. For now seek support of those who will understand, and know that the future is brighter with this blight having been removed. There is tragedy in your future, and no pretty words are going to soften its arrival. Be prepared and make sure your house is in order, as the strike could come from anywhere. You may already have a good idea of where it’s going to come from, but know that if this card appears with the Tower in the reading, it’s going to come from an unexpected source. The Ten of Swords reversed specifically indicates a painful ending that will lead to a new perspective on life. It is necessary, but it will be completely unpleasant. Know that the impetus for this change will come on like lightning, and will traumatize you irrevocably, but it will open the doorways for you to be in a better place in your life. 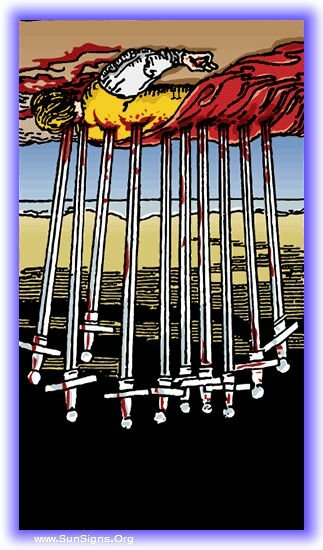 With the Ten of Swords card in the inverted position, the initial impetus has already struck, and you are on your way to recovery. It will take time, and there may be a long road to a complete recovery and assimilation of the lessons of this change, but know that there will be no fresh wounds from this source. The lightning has struck, and the wound laid. It’s going to be difficult, but what needs to be done at this time is to examine the situation for the best lessons you can take from it. Then combine the emotional intelligence with the intellect embodied by the swords to learn how to find the light in it. Coming down the road ahead is an emotional and mental wound that will leave you reeling. You may suspect the source already, but know that it will hit you with pin-point accuracy and tear right through your preconceptions about yourself. It will be a moment of utter turmoil, keep your friends close to help you pass through.